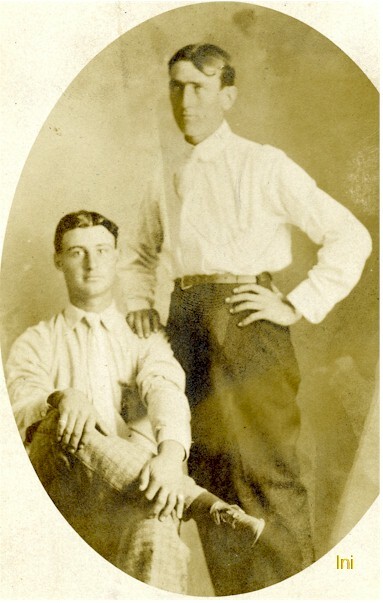 At least two Mulkey brothers were early residents of southwest Vernon county. Andrew Jackson Mulkey and Christopher Columbus Mulkey were sons of Christopher and Nancy (Read) Mulkey. The large Mulkey family lived in Lafayette County, MO. Lafayette County was a hotbed of Confederate (and Bushwhacker) leanings so it is no wonder that the Mulkeys were later Confederate Soldiers. Perhaps they were later attracted to Vernon County because one of their sisters lived there. Elizabeth (Bettie) Mulkey had married John Yokley on September 11, 1857, in Lafayette County. Andrew Jackson Mulkey was born December 25, 1837. Just prior to the Civil War, A. J. was married on February 2, 1860 to Nannie Prophet (Profitt) in Johnson County, MO. The 1860 census, shows 23 year old A. J. and his 18 year old bride living in Freedom Township, Lafayette County, MO (post office - Lexington). During the Civil War, A. J. was a private in the Confederate Army serving in Company F, 5th Cavalry. Following the war, he returned to his family and by the 1880 census had moved to Deerfield Township, Vernon County, MO. Their large family included: Emalee, age 17; William, age 19, Columbus, age 14; Alice, age 13; Lula, age 7; Maud, age 5; Dora, age 2; and John, age 1 month. Also living with A. J. and Nancy was Kerney Mulkey, age 16 was listed as "brother". So apparently he was a much younger brother of A. J. The 1900 census, showed Andrew and wife living in Bronaugh along with sons Clyde, age 17; and Horace B., age 14. That census states that A. J. was born in December 1836 and Nancy in January 1845. Neither agrees with the information on their grave marker. In 1910, Andrew, his wife and son, Clyde continued to live in Bronaugh. 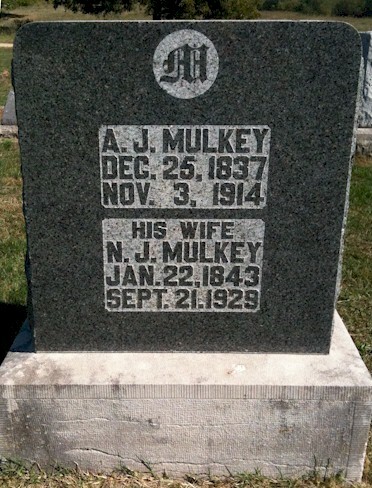 The grave marker to the right is in Worsley Cemetery, near Bronaugh and it shows that A. J. Mulkey died November 3, 1914 and Nannie died on September 21, 1929. Christopher Columbus Mulkey was born December 28, 1842. He served in Company B of the Missouri Cavalry for 3 years during the Civil War. After the war, he married Dialtha Lemaster, daughter of Mary Lemaster, on June 30, 1867, in Dade County, MO. By the 1880 census, the family had moved to Harrison Township, Vernon County, MO. It listed Columbus as age 38, "Diartha" as age 28 and children: Mary, age 12; William age 9, Louis, age 7; Nanie, age 6; Louana, age 4; ad Daisie, age 1. They continued to live in Harrison Township by the 1900 census. That census listed C. C., age 57; Dialpha, age 47; Edward, age 28; Carrie, age 18; Charley, age 16; and Delmer, age 12. In 1910, C. C. and wife were enmerated just across the state line in Drywood Township of Bourbon County, Kansas. At the time of this census, their daughter Daisie and her husband, Wesley Dumas, lived with them. Christopher Columbus Mulkey died on May 14, 1919. Burial was in Reynolds (Heaviside) Cemetery in Harrison Township, northwest of Bronaugh. C. C.'s obituary shown to the right was in the May 21, 1919 Bronaugh Journal. His grave marker from Heavisides Cemetery is shown below. The photo to the left is one that I found at an antique postcard show in Springfield, MO in August, 2013. The image was sent by Joe Mulkey to John Brown. 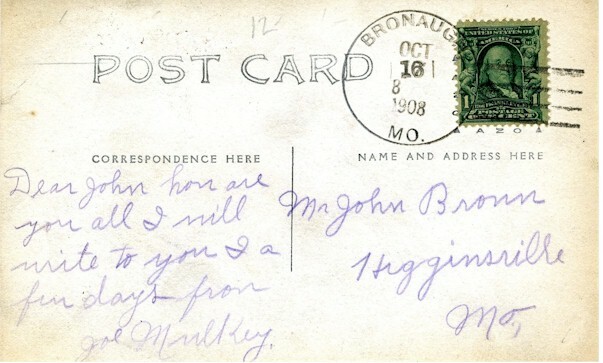 You will notice that it was postmarked in Bronaugh in October 1909. In researching, who Joe Mulkey is, I found that Horace B. Mulkey, son of A. J. and N. J. Mulkey (see top of this page), had the full name of Joseph Horace Blanton Mulkey. He was born in Missouri in 1886. Regarding this image, I don't know which one is Joe, but I assume that he must be one of them. I also don't know who John Brown might have been. If anyone has info as to which is Joe and who the other guy is, let me know.